Test the firmness, elasticy and stickiness of your pasta, rice or noodles. The firmness, stickiness, elasticity and bending strength define the overall texture of cooked and uncooked pasta, noodles and rice. 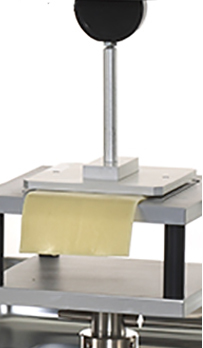 The breaking strength of uncooked spaghetti and lasagne sheets can be measured using the 3-point bind jig. Our unique spaghetti compression fixture measures the deflection time. This method is very effective in defining the correct cooking time. Pasta stickiness, noodle extensibility, pasta firmness and bending strength are just a few of the test types you can perform by combining the TA1 texture analyzer with our grips and fixtures for pasta, rice and noodles. View the application note Testing the Thickness of Spaghetti, Pasta and Noodles or watch the videos of uncooked spaghetti testing. Experience a selection of our grips and fixtures for here. If you cannot find what you are looking for, please contact us for a presentation of our full range.